I received an eARC of The Girl From Everywhere from NetGalley in exchange for an honest review. Nix lives aboard The Temptation with her father and their small crew. Perhaps that's already unusual for a girl of sixteen, but it gets stranger still, for Nix's father, Slate, is a Navigator. With a capital N. Slate can travel to any place on a map - real or mythological - so long as the map is accurate, and if he finds a map to 17th century France they'll travel to 17th century France. Slate's gift, which Nix has inherited, means they can travel through different worlds and different times. There's one map in particular Slate is obsessively trying to find: a map to Honolulu 1868, where he hopes to be reunited with Nix's deceased mother. But if Slate finds her, Nix's very existence could be in jeapordy. 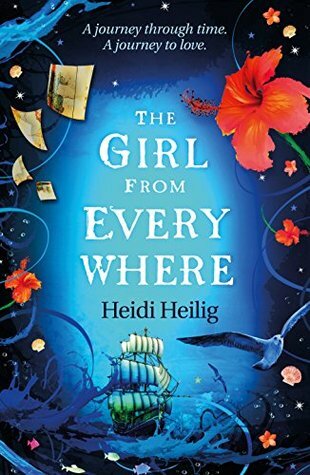 The Girl From Everywhere is Heidi Heilig's debut, and I loved it. It's such a fun, imaginative and whimsical story, and while it draws so much on history and mythology, it's also very grounded in reality. Throughout the book there's a recurring theme of losing paradise, and of such a thing being inevitable, which I really enjoyed. I'm also now desperate to visit Hawaii - it's always been a place I've wanted to visit, and now Heilig's depiction of it has made me want to jump on a plane this instant. I'm pretty sure this is my very first time travel book and I really, really enjoyed the way Heilig decided to go about it. I've always been a bit wary of time travel - I don't like the simple excuse of someone managing to build a time travel machine - but I thought the way Heilig's characters jumped through time was so fantastic. This is the first book I've read in a long while that's made me think: 'wow, I wish I'd thought of that'. Heilig's characters were so much fun, too. There's a lot of diversity here - Nix is a mixed race protagonist - but it's done in such a way that it doesn't feel like Heilig has written them diversely to 'make a point'. They've all come from different walks of life, some from different worlds, so it makes sense that Slate's crew is such a patchwork of people and cultures. I particularly enjoyed the relationship between Nix and Kashmir, not only because Kashmir is hilarious and, in my head at least, gorgeous, but also because the budding romance between them doesn't ruin their friendship, which is a beautiful relationship in and of itself. I'm hoping there isn't going to be a love triangle in the next book, however. I know love triangles can be done well, but they so rarely are and they're just not something I enjoy reading. I did enjoy Nix's first forays into romance, though; she doesn't dramatically declare her undying love for anyone and the romance is such a minor part of the story, but when it does pop up it's written very well and there's real chemistry between the characters. When I first started reading this I thought it might be a five star book, but the ending was just the teensiest bit rushed for my liking. I still enjoyed it immensely, but considering the pace of the rest of the book I think the end could have been longer and the book could have potentially been a complete story. That being said I'm glad we're going to see these characters again; I think Heilig has created a wonderful world with some memorable characters whom I'd like to learn more about, and I can't wait for more adventures with this crew! I'm so glad you liked this one even though the end was rushed. I keep hearing so many good things about this one. It does sounds very good! Thanks Micheline! ^_^ I think you'd enjoy this, so I recommend it!